Lance Marell Briggs (born November 12, 1980) is a former American football linebacker in the National Football League (NFL). He played college football at Arizona and was drafted by the Chicago Bears in the third round of the 2003 NFL Draft, where he played his entire 12-year career. A Sacramento, California native, Briggs attended Elk Grove High School in Elk Grove, California. While at Arizona, he was a two-time first-team All-Pac-10 Conference selection as a linebacker for the Arizona Wildcats football team. Briggs finished his college career with 308 tackles, 10.5 sacks, 36 tackles for losses, three interceptions, 10 passes deflected, five forced fumbles and four fumble recoveries in 33 games at strong side linebacker. Briggs (55) at the Bears summer training camp in 2008. Briggs was a third round draft pick (68th overall) by the Chicago Bears in the 2003 NFL Draft. In 2004, he made 126 tackles and was elected as a second alternate to the Pro Bowl. In 2005, Briggs was selected to represent the National Football Conference in the 2006 Pro Bowl. However, Briggs drew controversy when he refused to attend the Bears' summer camp, resulting in a temporary demotion. He finished the 2006 Chicago Bears season as a clutch performer on the Bears' defense. Briggs was selected to play in the 2007 Pro Bowl, but opted to decline the invitation because of an injured foot. He became a free agent following the 2007 playoffs, leaving his future with the Bears in the air. Despite Briggs’ high price tag, commentary from NFL on Fox revealed Brian Urlacher was willing to take a pay-cut in order to keep Briggs on the team. On February 16, 2007, the Bears officially placed the franchise tag on him, which guarantees him a one-year contract for the 2007 NFL season at slightly more than $7.2 million. Lance Briggs in November 2009. 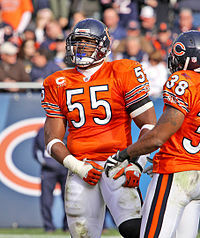 On March 12, 2007 Briggs announced that he no longer considered himself a member of the Chicago Bears. During a cell phone interview with Foxsports.com Briggs said "I am now prepared to sit out the year if the Bears don't trade me or release me, I've played my last snap for them. I'll never play another down for Chicago again." In explaining his demands, he said "The Bears have shown I'm not in their long-term plans so if that's the case, I don't want to be here." A report from Fox Sports on March 27 claimed that the Washington Redskins allegedly offered the Bears their first round pick in exchange for Briggs and the Bears' own first round pick. On March 28, Bears general manager Jerry Angelo confirmed that the Redskins have made a trade offer and stated, "We'll evaluate if that's good for us and get back to them". Angelo rejected the offer on April 3, but later stated they were interested in negotiating a deal the following day. The Bears then proposed a trade with the Redskins which included linebacker Rocky McIntosh as well as the Redskins first-round pick in exchange for Briggs. Briggs did not attend the team's first meeting after their Super Bowl XLI loss, or their mandatory mini camp session in May 2007. Despite his comments, the Bears re-signed Briggs to a six-year, $36 million contract on March 1, 2008. On September 2, 2011 Briggs and his agent, Drew Rosenhaus, formally asked the Bears organization for a trade, with three years left on his six-year contract. The request came after Briggs asked the Bears for a raise. Briggs made the 2012 Pro Bowl team, but was unable to play due to an ankle injury. On April 11, 2012, Briggs was given a one-year extension, increasing his contract through 2014. In week 7 of 2013 against the Washington Redskins, Briggs suffered a fracture in his shoulder. He rejoined the Bears in week 16, a 54-11 loss to the Philadelphia Eagles. Briggs recorded 24 tackles and one interception during the 2014 NFL season. After starting the season as the Bears' weak-side linebacker, Briggs was injured during week 5 and missed three games. He commented that his future with the team was in jeopardy, as he was in the final year of his contract. Briggs returned to play four more games, but injured his groin muscle during a week 13 game against the Detroit Lions. The Bears subsequently placed Briggs on their injury reserve list. He retired on September 2, 2015. Briggs became a free agent but remained unsigned through the offseason. He announced his retirement on September 9. Briggs (upper right) and Charles Tillman pursue Seattle Seahawks receiver Nate Burleson in a game in 2009. In August 2007 Lance crashed his new Lamborghini Murcielago into a light pole. He then left the scene of the accident and reported his car stolen. He was charged with leaving the scene of an accident. He was also cited for failure to give immediate notice of an accident and improper lane usage. ^ "Briggs on Pro-Football-Reference". rbref.com. Retrieved December 18, 2007. ^ Associated Press (March 7, 2007). "Briggs not happy with Bears; Angelo feels salary is just". ESPN. Retrieved March 7, 2007. ^ Glazer, Jay (March 12, 2007). "Bears Pro Bowler ready to sit out season". Foxsports.com. Archived from the original on March 15, 2007. Retrieved March 13, 2007. ^ La Canfora, Jason (April 27, 2007). "Redskins May Still Trade for Briggs". The Washington Post. Retrieved May 7, 2010. ^ Yahoo! Sports, Briggs a no-show at Bears minicamp (May 18, 2007), Retrieved on May 21, 2007. ^ McClure, Vaughn (August 29, 2011). "Bears' Briggs wants raise, not trade". Chicago Tribune. Retrieved September 3, 2011. ^ "2012 NFL Pro Bowl: Lance Briggs and Brian Urlacher Ruled Out - SB Nation Chicago". Chicago.sbnation.com. Retrieved August 4, 2012. .
^ "Briggs excited about one-year extension". Chicagobears.com. April 11, 2012. Retrieved August 4, 2012. ^ Sessler, Marc (October 21, 2013). "Lance Briggs (shoulder fracture) out 6 weeks for Bears". National Football League. Retrieved October 21, 2013. ^ Mayer, Larry (March 17, 2014). "Briggs happy Bears re-signed Tillman". Chicago Bears. Retrieved March 17, 2014. ^ Wiederer, Dan (November 8, 2014). "Lance Briggs faces uncertain future with resolve". Chicago Tribune. Retrieved November 29, 2014. ^ Edholm, Eric (November 28, 2014). "Lance Briggs lands on IR; career with Bears could be over". Yahoo! Sports. Retrieved November 28, 2014. ^ Schwab, Frank (September 2, 2015). "Lance Briggs retires (probably) to join CSN Chicago's Bears coverage". Yahoo! Sports. Retrieved September 2, 2015. ^ "Lance Briggs Stats". ESPN Internet Ventures. Retrieved March 22, 2014.